Mortitx: A real natural water park! Mortitx is one of the most representative and spectacular gorges of Mallorca, far from civilization, with a final at sea very amazing. The ravine is a splendid natural water park, we almost don’t ropes to descend it, overcoming most obstacles with slides, jumps and climbs along the course of this spectacular gorge. It is one of the canyons that can guarantee water for most of the year. Easy-medium level: if we do it with a boat collection. Medium-difficult level: if we overcome the ravine from the sea to the vineyard of Mortitx. Approach from the cellar Mortitx (if we start walking) or from the Caleta d’Ariant (if we start by boat). Sportive canyon descent (2,5 hours). OPTION A (easy level): Boat pick up at the end of the ravine. A five-star option, especially for beginners, and does not require great physical effort of the comeback of the ravine by land. This option also gives us the opportunity to see the wonders of the unspoilt coastline of Serra de Tramuntana. During the tour boat, we will see: cliffs over 200 meters above sea level, the unusual forat de Mallorca, the Castell del Rei, Cala Castell and Cala Estremer, spectacular caves and karst formations… are some of the wonders that we will appreciate during the route by boat. OPTION B (hard level): Via ferrata of 80 meters (60 minutes) + climbing by aggressive karst formations (40 minutes) + hiking (2 hours, 400 meters of positive slope). Big physical load and exposure of the via ferrata, but not suitable for people with vertigo or who are not physically fit. 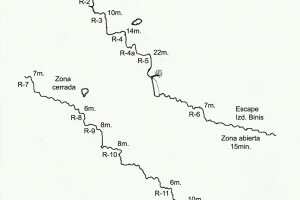 OPTION C (hard level): Overcome by the bed of the ravine (2 hours) + hiking (2 hours, 400 meters of positive slope). Big physical load of overcoming the canyon and hiking back, not suitable for people with vertigo or who are not physically fit.